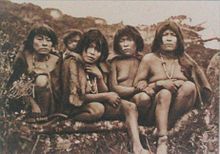 The Yaghan, also called Yagán, Yahgan, Yámana, Yamana or Tequenica, are one of the indigenous peoples of the Southern Cone, who are regarded as the southernmost peoples in the world. Their traditional territory includes the islands south of Isla Grande de Tierra del Fuego, extending their presence into Cape Horn. They have been there for more than 10,000 years. In the 19th century, they were known as Fuegians by the English-speaking world, but the term is now avoided as it can refer to any of the several indigenous peoples of Tierra del Fuego. (For instance, the Selk'nam inhabited the northeastern part of Tierra del Fuego.) Some are reputed to still speak the Yaghan language (also known as Yámana), which is considered to be a language isolate; however, most speak Spanish. As of 2017, Cristina Calderón, who lives in Chile territory, is known as the last full-blooded Yaghan and last native speaker of the Yaghan language. The Yaghan were traditionally nomads and hunter-gatherers. They traveled by canoes between islands to collect food: the men hunted sea lions, while the women dove to collect shellfish. In 1871, Anglican missionaries Thomas Bridges and George Lewis established a mission at Tierra del Fuego, where they both raised their families. Bridges had learned the language starting when he lived on Keppel Island at the age of 17. Over more than a decade, he compiled a grammar and a 30,000-word dictionary of Yaghan-English. 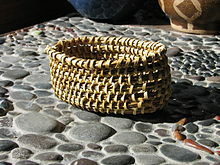 Bridges' second son, Lucas Bridges, also learned the language and is one of the few Europeans to do so. In his 1948 book, which was a history of that period, he writes that in Yaghan, their autonym or name for themselves was yamana (meaning "person" (though modern usage is man only, not woman) – the plural is yamali(m)). The name Yaghan (originally and correctly spelled Yahgan), was first used by his father Thomas Bridges from the name of their territory, Yahgashaga, or Yahga Strait. They called themselves Yahgashagalumoala (meaning "people from mountain valley channel" -lum means 'from', -oala is a collective term for 'men', the singular being ua). It was the name of the inhabitants of the Murray Channel area (Yahgashaga), from whom Thomas Bridges first learned the language. The name Tekenika (Spanish: Tequenica), first applied to a sound in Hoste Island, simply means "I do not understand" (from teki- see and -vnnaka (v schwa) have trouble doing), and evidently originated as the answer to a misunderstood question. They kept warm by huddling around small fires when they could, including in their boats to stay warm. The name of "Tierra del Fuego" (land of fire) was based on the many fires seen by passing European explorers. Their natural resting position was a deep squatting position, which reduced their surface area and helped to conserve heat. The Yaghan may have been driven to this inhospitable area by enemies to the north. They were famed for their complete indifference to the bitter weather around Cape Horn. Although they had fire and small domed shelters, they routinely went about completely naked in the frigid cold and biting wind of Tierra del Fuego. Women swam in its 48-degree-south waters hunting for shellfish. They often were observed to sleep in the open, completely unsheltered and unclothed, while Europeans shivered under blankets. A Chilean researcher claimed their average body temperature was warmer than a European's by at least one degree. Mateo Martinic, in Crónica de las tierras del sur del canal Beagle, asserts that there were five groups under the Yahgan people: Wakimaala on both shores of the Beagle Channel from Yendegaia to Puerto Róbalo and at the Murray Channel; Utumaala from (today) Puerto Williams to Picton Island; Inalumaala at the Beagle Channel from Punta Divide to Brecknock; Ilalumaala in the south west islands, from Cook Bay to False Cape Horn; and Yeskumaala in the Islands around the Cape Horn. 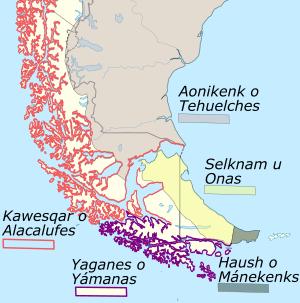 The Yaghan established many temporary, but often reused, settlements within Tierra del Fuego. A significant Yaghan archaeological site from the Megalithic period has been found at Wulaia Bay. C. Michael Hogan has called it the Bahia Wulaia Dome Middens. The Yaghan left strong impressions on all who encountered them, including Ferdinand Magellan, Charles Darwin, Francis Drake, James Cook, James Weddell and Julius Popper. Spanish explorers came upon the area around Tierra del Fuego in the early sixteenth century, but it was not until the 19th century that Europeans started to be interested in the zone and its peoples. The Yahgan were estimated to number 3,000 persons in the mid-19th century, when Europeans started colonizing the area. The British officer Robert FitzRoy was made captain of HMS Beagle in November 1828, and continued her first survey voyage. On the night following 28 January 1830 the ship's whaleboat was stolen by Fuegians, and over a month of fruitless searching to recover the boat he took guides and then prisoners who mostly escaped, eventually taking a man (renamed York Minster, estimated age 26) and a young girl (renamed Fuegia Basket, estimated age 9) hostage. A week later he took another youth hostage (renamed Boat Memory, estimated age 20) and on 11 May captured (estimated to be 14) Jemmy Button. As it was not possible to easily put them ashore, he decided to "civilise the savages." He taught them "English..the plainer truths of Christianity..and the use of common tools" and took them with the return of the Beagle to England. Boat Memory died, but the others were considered "civilised" enough to be presented at court in London in the summer of 1831. On the famous second voyage of HMS Beagle, the three Fuegians were returned to their homeland along with a trainee missionary. "without exception the most curious and interesting spectacle I ever beheld: I could not have believed how wide was the difference between savage and civilised man: it is greater than between a wild and domesticated animal, in as much as in man there is a greater power of improvement." In contrast, he said of the Yahgan Jemmy Button: "It seems yet wonderful to me, when I think over all his many good qualities, that he should have been of the same race, and doubtless partaken of the same character, with the miserable, degraded savages whom we first met here." The mission was set up for the three Fuegians. When the Beagle returned a year later, its crew found only Jemmy, and he had returned to his tribal ways. He readily still spoke English, assuring them that he "had not the least wish to return to England" and was "happy and contented" to live with his wife, in what the English thought a shockingly primitive manner. This encounter with the Fuegians had an important influence on Darwin's later scientific work. The Yaghan were decimated by the endemic infectious diseases carried by Westerners. The English established missions at Keppel Island in the Falklands, and Ushuaia on Tierra del Fuego, in an effort to teach the natives English, Christianity, and farming. The Yahgan suffered disruption of their habitat starting in the early-to-mid 19th century when European whalers and sealers depleted their most calorie-rich resources, forcing them to rely on mussels chopped from rocks, which provided many fewer calories for the effort needed to gather and process them, in the late 19th century when waves of immigrants came to the area for the gold rush and a boom in sheep farming. They did not understand the British concept of property, and were hunted down by ranchers' militias for the offense of "poaching" sheep in their former territories. In Sailing Alone Around the World (1900), Joshua Slocum wrote that when he sailed solo to Tierra del Fuego, European-Chileans warned him the Yaghan might rob and possibly kill him if he moored in a particular area, so he sprinkled tacks on the deck of his boat, the Spray. In the 1920s, some Yahgan were resettled on Keppel Island in the Falkland Islands in an attempt to preserve the tribe, as described by E. Lucas Bridges in Uttermost Part of the Earth (1948), but they continued to die off. The second-to-last full-blooded Yaghan, Emelinda Acuña, died in 2005. As of 2017, the last full-blooded Yahgan was "Abuela" (grandmother) Cristina Calderón, who lives in Chilean territory. She is the last native speaker of the Yahgan language. According to the Chilean census of 2002, there were 1,685 Yaghan in Chile. York Minster, Fuegia Basket and Jemmy Button, three Fuegians (Yahgan) who were taken to England with the captain and crew of the Beagle. The sailors coined these names for the men during this first voyage. ^ a b c d "Yámana." Ethnologue. Retrieved 18 Dec 2011. ^ Grenoble, Lenore A. and Lindsay J. Whaley "What Does Digital Technology Have to Do with Yaghan?" Linguistic Discovery. Volume 1 Issue 1 (2002). Retrieved 19 Dec 2011. ^ James Taylor (17 May 2016). The Voyage of the Beagle: Darwin's Extraordinary Adventure Aboard FitzRoy's Famous Survey Ship. Bloomsbury USA. pp. 48–50. ISBN 978-1-84486-327-3. ^ Hazlewood, Nick (2000). Savage: The Life and Times of Jemmy Button. London: Hodder & Stoughton. ^ Darwin, Charles (1909). The Voyage of the Beagle. New York: Collier. p. 210. ^ a b Darwin (1909). The Voyage of the Beagle. pp. 212–213. ^ Yannielli, Joseph (2013). "A Yahgan for the killing: murder, memory and Charles Darwin". The British Journal for the History of Science. 46 (3): 415–443. doi:10.1017/S0007087411000641. ^ Taussig, Michael (1993). Mimesis and Alterity: A Particular History of the Senses. New York: Routledge. pp. 86–87. ISBN 9780415906876. ^ "Chile: indigenous people faces extinction". Mapuche.nl. Retrieved 2012-12-28. ^ Barnett, Lincoln (1 June 1959). "Uttermost Region of the Earth". Life. 46 (22). ISSN 0024-3019. Retrieved 2013-02-28. Furlong, Charles Wellington (April 1911). "Cruising WIth The Yahgans". The Outing Magazine. LVIII (1): 3–17. Retrieved 2009-08-16. Furlong, Charles Wellington (December 1915). "The Alaculoofs And Yahgans, The World's Southernmost Inhabitants". Proceedings of the Nineteenth International Congress of Americanists: 420–431. Retrieved 2009-08-16. Murphy, Dallas. Rounding the Horn: Being the Story of Williwaws and Windjammers, Drake, Darwin, Murdered Missionaries and Naked Natives – a Deck's-eye View of Cape Horn. Basic Books, 2005. ISBN 978-0-465-04760-4. Wikimedia Commons has media related to Yamana. Darwin, Charles, Robert Fitzroy, and Philip Barker King: Narrative of the Surveying Voyages of His Majesty's ships Adventure and Beagle, between the years 1826 and 1836, describing their examination of the Southern Shores of South America, and the Beagle's circumnavigation of the Globe. London: Henry Colburn, 1839. This page was last edited on 6 March 2019, at 20:47 (UTC).